Today being an athlete is much more than playing a sport. In today’s NBA we have high profile outspoken players such as LeBron James and Steph Curry who provides thought-provoking commentary just like athletes such as Bill Russell, Jackie Robinson and Muhammad Ali did before them. 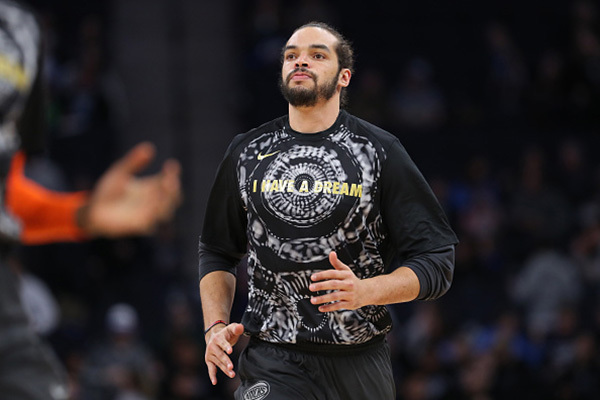 One of the players that personify Dr. King dream is Joakim Noah. He’s one of the most outspoken players in the NBA. He founded The Noah’s Arch Foundation which is designed for kids in Chicago to become more aware and conscious of their ability to make a positive impact on themselves. According to their mission statement, the goal of Noah’s Arch is for children to tap into their unique passions and achieve their full potential in all areas of their lives. 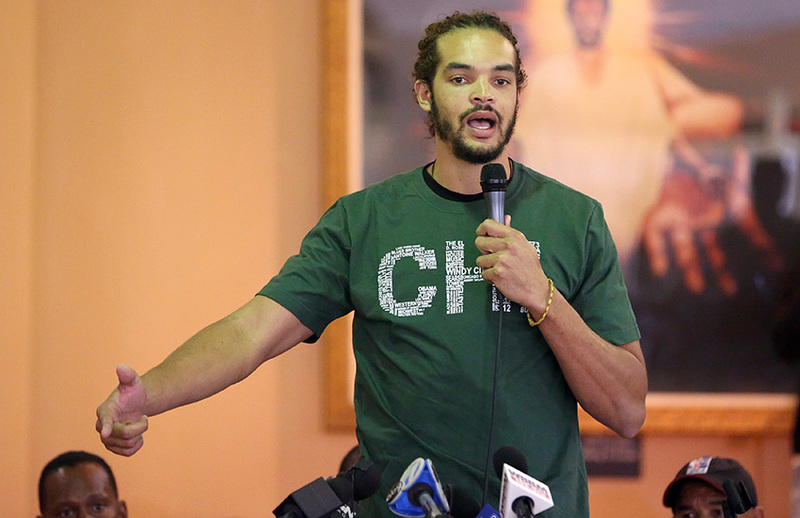 ” My foundation is very important to me and to the children in Chicago. They go through so many things there—the violence and the poverty make it a rough place to live in some neighborhoods, ” says Noah. Noah has always believed strongly in his beliefs. A few years ago, Noah raised a few eyebrows by skipping out on a dinner with the troops at West Point. His decision to skip this event was based on his anti-war stance, a stance that he still feels strongly about. Injuries and time mean Noah is no longer the bruising force that led to two All-Star appearances and a Defensive Player of The Year award. 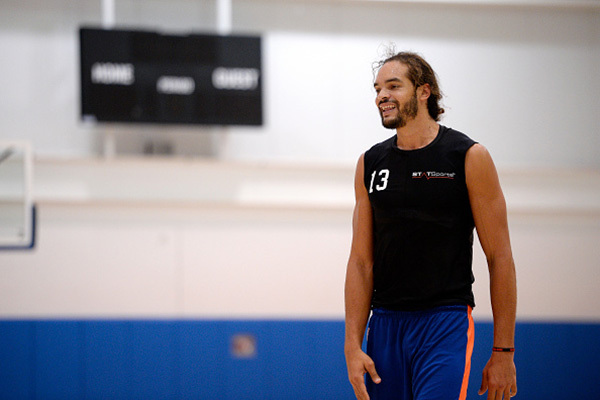 He now finds himself in a mentorship role on the Knicks. His minutes are sparse these days, but when he plays he still occasionally displays the fiery competitive effort that made him into one of the most overachieving players of his generation. What does Dr. King’s legacy mean to you? Dr. King is someone who was very important in history. He symbolized equality, he fought against racism and poverty. He was somebody who sacrificed for the people, he was murdered for fighting for the right cause. It’s great that he’s remembered because he’s somebody this country will never forget. With today’s political climate did playing on MLK day have a more meaningful purpose? Yes, for sure. When you can bring some awareness to someone who brought so much hope and positivity into the world. Man, today in 2018 we have to deal with nuclear bombs and racism, it’s crazy. So, yes, honoring Dr. King in today’s political climate makes it meaningful than before. Did any of his quotes or speeches make an impact on you? Of course, they did. His “I Have A Dream” speech is one of my favorites, I liked the fact that he stood for something that was bigger than himself. His influence continues to make the world a better place today. How do you think we can fix race relations in America? One of the biggest platforms for that is sports. With sports, it doesn’t matter what race or background you come from. Sports brings people together, it’s one of the most important platforms. Also, the classroom is another important place because education can bring people together. President Trump reportedly made some disparaging comments about Haiti and African countries. What are your thoughts on that? I don’t stand for anything he stands for. Being African myself, I find it very disrespectful. What’s crazy is somehow he was elected, which means a lot of people feels that way. It’s disappointing because sometimes we’ve been taking steps in the right direction as a country, but when you see the leader of the free world making comments like that, it’s disappointing. Do you feel we’re regressing as a society in terms of race relations? I don’t think so. I think that if anything it’s going to make us stronger. We’re going at this time and say this is not the direction we want our country going in. We can learn from this and understand that the economy is not everything. There’s definitely more to being the leader of the free world than the economy, and I hope that [the next] election shows that. Do you still have an anti-war position? Of course, I do. I hate the fact that young kids have to go and fight wars for peoples’ profits. It bothers me a lot. You’re also an advocate against gun violence. How did that come about? I just got tired of hearing about all these tragic deaths at the hands of guns. It really breaks my heart to see all these tragic events such as the incident in Las Vegas.